I thought my first diy project for this blog would be fitting if I returned to one of my first major projects I ever built. 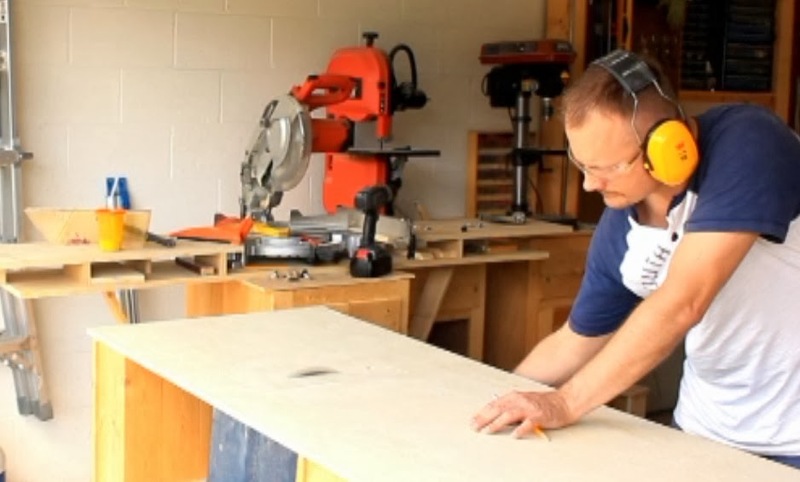 The table saw workstation. I mentioned it in the opening post "A whole new diy world" . I needed a place to not just store my new table saw, but I wanted it to always be ready to cut despite not being able to have a dedicated place for it. I was also short on storage and surfaces in which to work on projects. 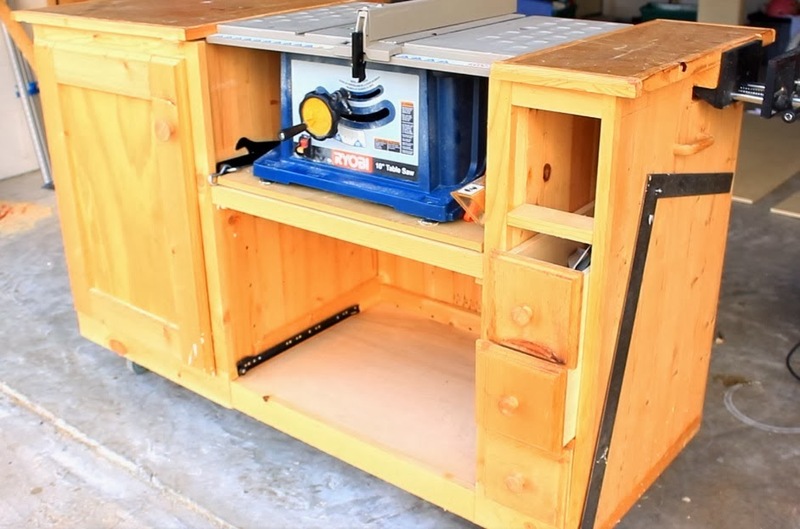 This table saw workstation was the perfect solution. It combined all elements of my needs. I built it in 3 sections and joined them together. The underside is reinforced with a 2x4 frame and the 5" double locking casters are attached to that. It is incredibly sturdy and I have never once felt it was anything but durable in its construction. If I had it to do over again, I would build this exact same unit. However, I have come to the realization that storage without a purpose in mind is wasted space. So I will be redesigning the storage with specific items in mind. My most pressing need however, is dust collection. It is sort of like stamp collecting. When done well, it is a source of pride for the collector. If not, it is a subject relegated to the back corner of the proverbial closet in hopes that the subject never comes up in conversation. Its elusive and I must admit, for most of my woodworking tenure, non existent. 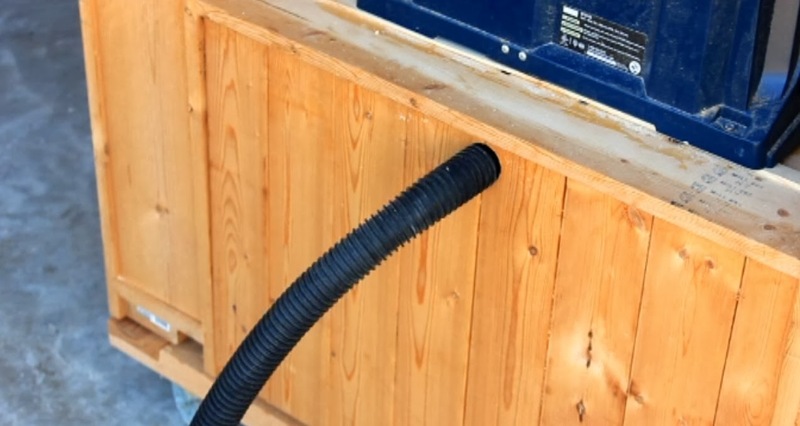 I drilled a series of 1/2 diameter holes under the saw and then enclosed a portion of the cabinet under the saw in order to funnel the dust to a port that my shop vac would attach to. A hole big enough to accept my shop vac hose was added to the back of the center section in order to provide some sort of dust collection. This system never worked as intended. 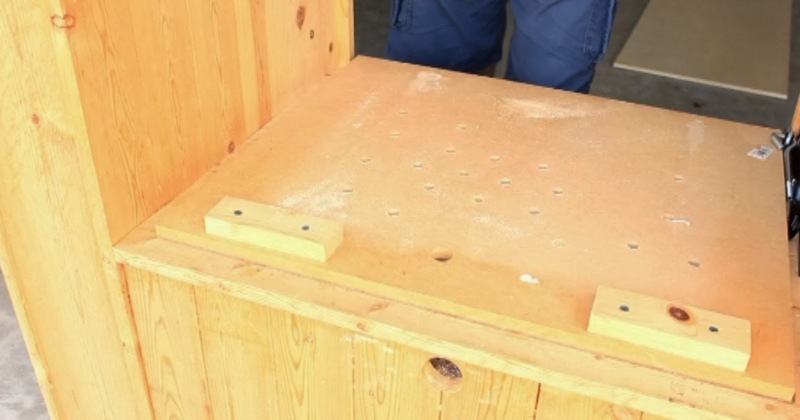 The holes get clogged easily and the dust builds up under the table saw. This forces me to move it on a regular basis and clear the saw dust that has built up. The saw most likely needs to be enclosed or a more powerful shop vac applied. I have toyed with several different ideas but in the end I think I will just cut a large hole under the saw and allow gravity to do its job. I know it sounds a little rudimentary but I think sometimes simplicity is the best solution. I think I'll adopt the K.I.S.S method for this particular issue. I'll begin by marking out lines where the table saw sits. I only need a rough estimate of where the saw sits and in my case I can tell by the discoloration of the panel that it has sat on over the years. I suppose I could have measured the length and width of the base of the saw and subtracted that from the length and width of the area between the two side sections. However, I have learned that if you don't need to measure, then don't measure. This is clearly a case where I do not need to measure. Drilling pilot holes at the four corners of my marked lines provides a good starting and stopping point for each of my jigsaw cuts. The cuts here do not need to be all that accurate or particularly straight so its a point and go operation. Now that that is done I'll move on to the new top. The current top is two sides with the table saw in the middle. 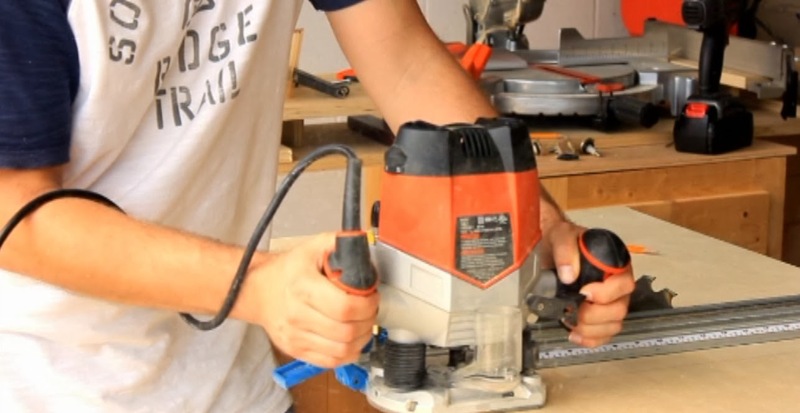 This worked well but the Ryobi has some short cummings that I aim to improve. The miter slots are 5/8" T style slots. I want to upgrade to a 3/4" after market miter gauge that I bought years ago and this is a good opportunity. Also the insert sits slightly below the rest of the top. This is not only inaccurate, but as I found out the hard way, extremely unsafe. As a work piece is passed over that section and it comes back onto the higher sitting top it pushes the work piece up and into the back of the blade. As a result of this I rarely used the saw without the blade guard and anti kickback paws. I certainly never used the saw for rip cutting without them. My plan is to span a piece of plywood across the whole of the workstation providing a smooth flat surface for greater accuracy and safety. I thought about different types of material to do this with but since weight and thickness is a factor to consider I'm going with a 3/4" piece of ply. Melamine would have been a better choice for stability, but I was concerned about the weight. My next step is to figure the approximate position the blade will come thru the new top. So I take measurements from the side of the workstation to the blade. Then add an inch for the overhang of the top. I then do the same thing from the front of the workstation to the blade and the back to the blade. Transfer those measurements to the piece I plan to use for the top and I have the relative position that the blade will be. I measure 2" on either side of this mark. I do the same for the front and back and I have the area I want to cut for the new insert. Again, it is a matter of drilling pilot holes for my jigsaw and this time I want to be a little more judicious with my cuts. Now that I have the hole for the insert, I'm ready to cut a piece of material for it. So I take a piece of ply the same thickness as what I am using for the new top and place it underneath. Trace the opening and make my cuts, however I'm going to stay about 1/16" off the pencil marks. Now it is a matter of sanding down to a good fit with no play. I must admit, this part takes patience if you are sanding by hand like I am. The trick is to not sand to much or get in a hurry. Sand a little, then check the fit. Take note of where you need to spend a little more time and stay off of places that already fit well. I'll make a pencil mark on sections that need some attention and then sand by hand when I get close to a good fit. Before I go any further I want the blade to be 90 degrees to the front and back of the top. So I lay out my framing square against the blade and adjust the top to where I need it. Then clamp down the top to hold it in place as I attach the top from below with screws. However, I need to be careful not to punch through the top. I have 3/4" strips of pine under the 3/4" plywood top and I am using 1 1/4" screws. I should be OK, but just in case, I'm going to take the screws in at an angle to be safe. I now need to level the insert with the plywood top. As I mentioned earlier, the metal insert that came with the saw is not level so if I just lay the insert in place, it will not be level either. In order to compensate, I countersink holes for some flat head screws that I've had sitting in my spare misc. screw bin just waiting for a job to do. Then I can adjust the height of each screw until my new insert sits level with the surrounding top. This portion of the project requires a fair amount of accuracy because without it, I am wasting my time. So going slow and paying attention to the smallest detail is the name of the game. Once I have the fit that I want, it is time to replace the insert and raise the blade. I wont spend a lot of time here since this part is self explanitory but I will say, go slow, and be careful. I was a little concerned if I went to fast the blade may catch the insert and flip it out at me so I stood off to the side while doing this. However, by going slow and making sure the fit was snug, I had no problems and everything looked good. Once the blade is raised I can then lay my framing square back against the blade, recheck the blade is square to the top and lay a mark for the miter slot. At some point I realized I could just place a straight edge against the blade and route and 3/4" slot. Well, I've done a lot and everything is looking good. I am going to need a new rip fence and I have an idea in mind but I'll cover that in another post and video. Stan, I love the site. I've watched quite a few of your videos on YouTube. I'm going to make a tablesaw workstation for my crappy Craftsman tablesaw this spring, because the included base is super wobbly, and I like the idea of having the freedom to roll the saw out of the way, and the added storage. I'm wanting to attach a 3/4" piece of ply to give my more space and accessory options as you eluded to in your post, and I'm currently suffering with the same T track blues. 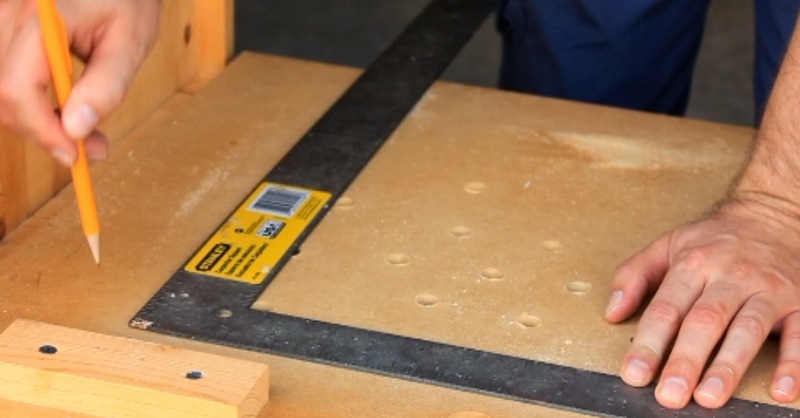 That said, if I can ask why you created a separate insert for the plywood top, instead of just attaching the sheet, then running the blade up to basically create a zero clearance insert for the saw? Keep up the good work! Hello, It has been a while but I believe I address that question in the Q&A video. 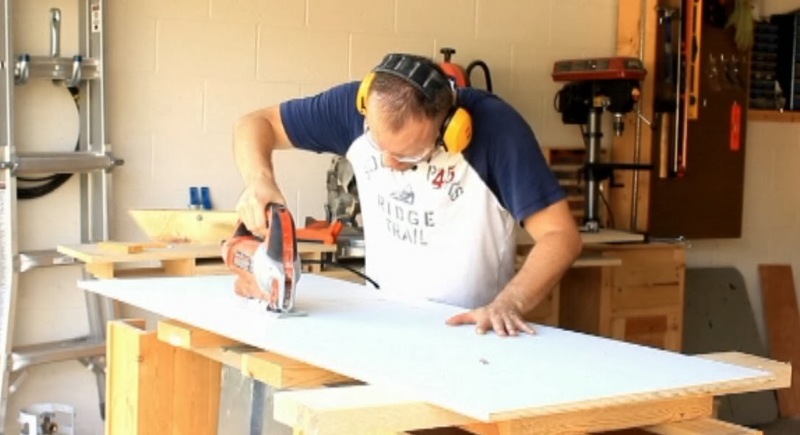 Here is the link http://www.simplyeasydiy.com/2014/12/in-depth-table-saw-workstation-part-1-q.html. If I don't then just email me and I'll try and answer more thoroughly. Thanks.